This cabling infrastructure course provides a complete foundation for the enterprise designer based on industry best practice and cabling standards. It will take the student through the initial design considerations, provide all of the required background knowledge then focus on the detailed design concepts finishing with project planning. This course is intended for anyone who will be involved in the Design and Engineering of Structured Cabling Systems. The primary audience will be installers moving into design, designers, sales support, technical support personnel, account managers, consultants and 'end users' involved in infrastructure specification. Those students who are specifically looking for SYSTIMAX Design certification should take the SP3321 course instead of this course. If you are a NETCONNECT or UNIPRISE Partner, successful completion of the SP3000 will provide you ACT III design accreditation. It assumes no previous design or cabling experience but equally will suit someone with experience but requiring a recognized design qualification. This course will take new students to a high design level. This detailed foundation course is further complimented with a series of other specialist courses such as Fiber Optic Specialist SP4420, Field Testing SP3500 and SP8850 Data Center Design. These are all part of a suite of CommScope infrastructure specialist certifications that also include SP6500 RF Wireless Infrastructure Specialist and SP6180 CommScope Microwave Infrastructure Specialist. Information gathering and design analysis – reviews the designers role and responsibilities, what the customer is looking for in Infrastructure purchases, who you need to consider partnering with. It will cover the design brief including project cycles, decision makers, specification and bid as well as overviewing the very latest trends in enterprise infrastructure design. Background knowledge – provides the foundation knowledge you will need before you can set-off on the cable design aspects of the course, it includes: Networking Fundamentals, Transmission Theory, Standards and Performance. Networking Fundamentals gives those not involved in Local Area Network design the broader picture and its influence on infrastructure design. Transmission Theory ensures that the designer appreciates the importance of good and poor design and the resultant impact it can have on the project. Standards and Performance takes a detailed look at the key standards that influence infrastructure design, the standards bodies, which apply and their shortcomings. It pays particular attention to the commercial building standards regional and global TIA, ISO, CENELEC, associated design standards and the current and future application interface standards that are all essential to the designer. The Pathways and Spaces section gets to grips with TIA569, ISO/IEC18010 and EN50174 amongst others. This topic introduces the 1st stage in planning a commercial design, Equipment and Telecommunications rooms, linking buildings, containment planning and specification. Design of the cabling infrastructure is the major part of the course and this topic is detailed in Horizontal, Building Backbone, Campus Backbone and Administration lessons. This details copper and fiber design based on core standards TIA568, ISO/IEC11801 and EN50173 amongst others. Horizontal will cover design distances, reduction calculations, connector counts, inter-connect vs cross-connect, CP and MUTOA design. It includes consideration of Building Automation (BAS), planning for Wireless Access Points (WAPs) and other applications such as Power over Ethernet (PoE). Backbone designs includes fiber loss calculation and application performance considerations. The student is provided a clear understanding of administration principals and administration field design. Design Delivery covers Project Planning, which overviews infrastructure planning, contractor relationships, integrated infrastructure project considerations, site surveys, Bill of Materials (BOM), Scope of Work (SOW), Installation planning, project meetings, safety, testing and commissioning. You will study this course online in a self-paced format. The course is made up of a large number of webcast lessons and online multiple choice assessments giving immediate feedback. Any level of pass in the accumulative overall assessment score. If you are involved in design, project management, consultancy, infrastructure specification of enterprise projects and require a thorough understanding of both standards based design then this course is for you. Receive the course certificate and the CSCIS CommScope Structured Cabling Infrastructure Specialist badge. This course is part of the Infrastructure Specialist Certification. By completing this course you will achieve the CommScope Structured Cabling Infrastructure Specialist (CSCIS) certification. 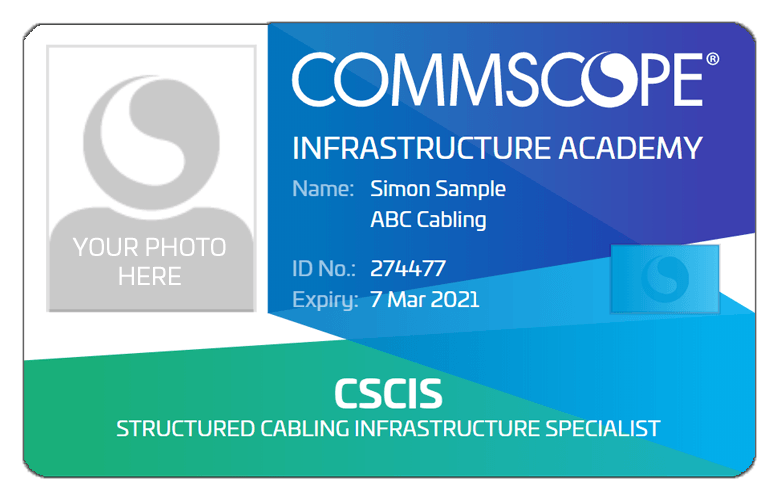 If you are a member of a CommScope Partner you’ll be entered on the CommScope certification database and a badge is available to you via the Infrastructure Academy App.